Copyright: Any of the photographs submitted may be used by Graffiti for any type of promotional activities but not for commercial purposes. The author retains intellectual property rights and will be cited in the credits. 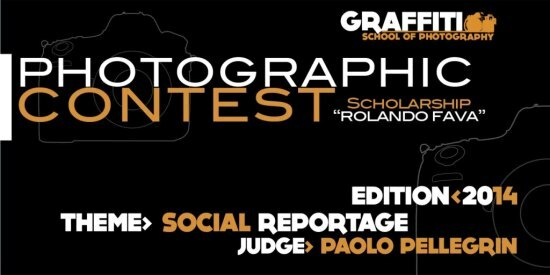 The contest provides a good occasion to promote photographic reportage inspired by social themes, to give more exposure and broader diffusion to this aspect of photography and to create new opportunities for those thinking of embarking on a career of photojournalism. The images presented must adhere closely to the theme of social reportage and be supported by a brief, synthetic but effective written account of the situation portrayed. The competition is about reportage which is open to free and personal interpretation. It must tell an everyday story, reveal a slice of human life in the social realm. The story depicted can have been photographed either in Italy or abroad. The project is to contain a maximum of 20 images and a short written description of not more than 15 lines. Submit your images on CD-DVD by post. Image requirements: jpeg – RGB format – Size cm 20×30 – 300 dpi.